Pearl Pedal Family 2013 . 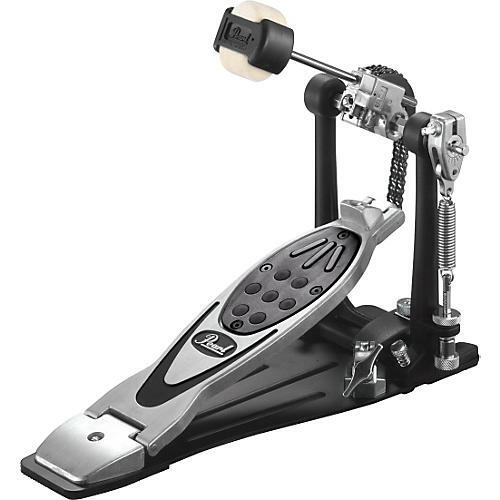 The Pearl P-2000C PowerShifter Eliminator Chain-Drive Pedal is a chain-drive pedal featuring the interchangeable cam system! Comes with 4 uniquely shaped and color-coded cams. The black cam is Pearl's original linear-feel cam. The white cam is also linear but larger in diameter for a lighter feel and increased power. The blue is offset and starts with a light feel at the beginning of the stroke and accelerates with speed and power upon impact. The red is radically offset and provides great response for sensitive footwork and extreme power upon impact. All cams attach and detach easily at the push of a button.